Today I’m fortunate to be hosting Jill Hughey, author of the Evolution Series of historical romances set in the medieval period after Charlemagne’s death, in Francia and Bavaria. Has writing professionally changed you as a person? Yes. Committing to writing as the vocation of my future has focused my efforts and helped me to prioritize my time and energy. I am blessed with parents who like to travel. When I was four we made our first trip to a dude ranch in Jackson Hole, Wyoming. Moosehead Ranch is a child’s paradise, and you can imagine the joy for a little girl who loved horses to be able to ride twice a day! We’ve returned there as a family many, many times and almost every minute is a cherished memory. I’d like to continue to write for decades, and be able to help support my family and “float” my retirement with my writing. If you could do a guest role on your favorite TV series, what show would it be and what character would you play? My favorite series right now is probably “The Americans.” If we are indulging in absolute fantasy, I guess I would play a character trying but failing to seduce Matthew Rhys’s character because I wouldn’t mind having a scene or two with him (love his voice), but I’d never be comfortable actually doing anything physical with a stranger OR on screen. What book character would you nominate for president? 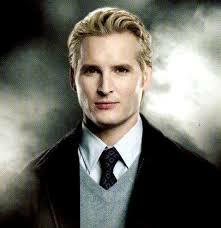 OK, this will sound completely hokey, but I would nominate Carlisle Cullen, from Twilight. Before some of you start gagging, hear me out. He is compassionate, has centuries of perspective, and could fire his entire secret service detail. There is the whole not-technically-American-born thing, but the Cullens are really good at creating identities. CA: You know, Jill, I really think that’s a great choice! What is the greatest positive impact you’ve had on another person? Please describe the circumstances. Well, that is a hard one. My husband and I have both been struggling to show our oldest son that sometimes you have to work toward a goal even when you don’t feel like it, or even when it isn’t your goal. We’ve been fighting the battle of the math grade, and early indications are that now, as a junior in high school, he may finally understand that every lesson, every chapter, every course, is a stepping stone to the next thing, so what seems stupid and irrelevant today is important for something you need tomorrow. If I can send my two kids into the world with a sense of responsibility for themselves, I’ll be satisfied. CA: Raising children is definitely a challenge and a balancing act as well. Time. I never have enough. What are absolute food and drink essentials for your writing process? Coffee, mostly decaf, surprisingly enough. Food is a real temptation. I’d love to snack on salty, crunchy stuff all day long while I write…but I don’t! I swear! What one thing do you suggest for men, in general, to do in order to be more romantic in a relationship? Pay attention to what is meaningful to your partner. Just because your idea of a romantic interlude is a nice dinner out doesn’t mean dinner is her idea of a romantic interlude. For all you know, she’d like you to spend a few hours yardsaling with her, or to put the dinner money toward a pair of shoes she’s been denying herself. Or maybe all she wants is for you to write a few heartfelt words on a piece of scrap paper. Pay attention. Please tell us about your newest release, Little Witch: Historical Romance Novella. It was originally going to be a short story. Salena, my heroine, had way too much backstory for that to work, so I just kept writing until the story was properly told. It ended at 49,000 words, which is either a short novel or a long novella. Little Witch tells the story of a young woman who is a rural outcast dreaming of escape from cruel neighbors and tedium, and Nox, the Lord of Ribeauville’s employee, who refuses to become attached to anyone due to his childhood loss of his entire family. Thank you for the opportunity to visit today, Carole! CA: It was absolutely my pleasure! Trees around the church offered patches of relief from the warming June sun. Salena backed away from the building, shading her eyes to see as much of it at once as possible. She finally gave up, dropping her hand to her side, defeated. “What is it?” Nox asked. Nox almost said something light-hearted about sometimes wanting fewer people around. Her forlorn expression stopped him. “There is nothing wrong with grass and trees,” he said. “The air smells different,” she said, inhaling. “Smoke and latrines,” he suggested. She tilted her head back. The sun highlighted her full lips, the temptation of them overwhelming the internal warning her words incited in him. “Don’t listen to my rambling,” she said to the sky. “I certainly don’t imagine I belong in that great house.” She sighed again. “I don’t know why I keep blurting these things out to you.” She gave him a direct look. “Actually, that is a lie. I tell you because there is no one else I can tell. I cannot tell anyone in my family. They would be worried or hurt. They would think that something must be done when I know very well there is nothing to do.” She set her shoulders. “Forgive me. Let me go find Grant. 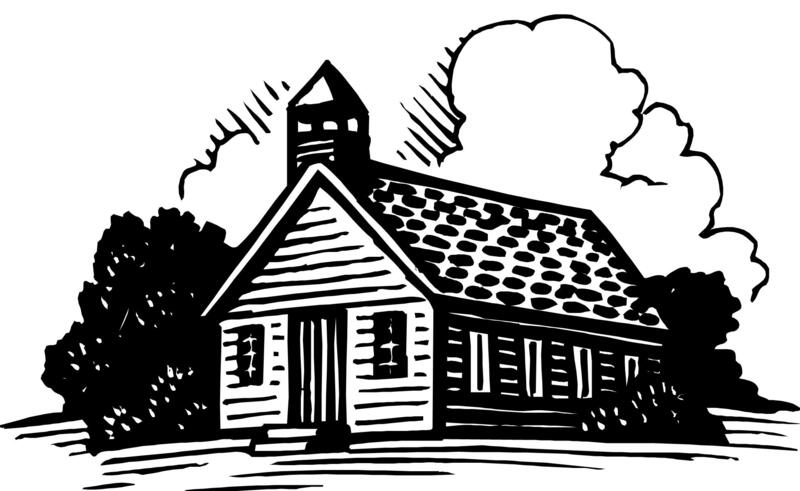 You were probably hoping to spend the day with him, not stuck with his awestruck hayseed sister and pregnant wife.” She shifted to walk around him. Those soft lips parted in wonder at his announcement, and the eyes that frightened other people drew him in. He kissed her. On the grounds of the church in full view of anyone who might happen along, he kissed her and drank her in after a tedious month of pretending he was not thinking of her. He pulled her against him despite a long night of convincing himself he had not wanted to do just that the moment she hopped down from the cart yesterday. She broke the kiss to settle against him, her ear on his chest, head tucked under his chin. Her hands settled on his waist in that way she had that implied a comprehensive possession of his body, the heat of her palms coursing through him like warmed wine. “I missed you, Nox,” she said, devastating him with the simplicity of the statement. He did not know how to answer since this had been what he had worried about all along. He had told himself he dreaded her attachment to him. If that was true, how could she feel so perfect nestled against him? How could her words calm him instead of worrying him? He said nothing, but could not stop the momentary tightening of his arms around her before he set her away from him with an internal reminder that he had nothing more than occasional kisses to offer. 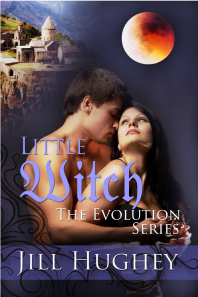 Little Witch: Historical Romance Novella is the fourth book in the Evolution Series and is available on Amazon at http://www.amazon.com/dp/B00EUA1TI8. Most of Jill’s books are available in print, and Little Witch will be there soon if it isn’t already. 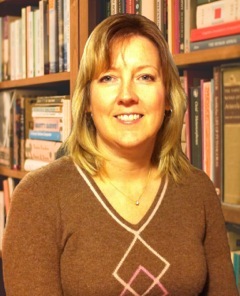 If you’d like to keep in touch with Jill Hughey, she blogs at http://jillhughey.blogspot.com, is on Facebook at www.facebook.com/jillhugheyromance, and tweets @jillhughey. Please remember to leave your e-mail address in your reply! SUMMER READING & GREAT GIVE-AWAYS! Lots of other prizes awarded daily! Winners must live in U.S.A. or Canada. “Miss Luebber. Well, ain’t you the big sugar?” Franz tipped his hat. His gaze roamed down the line of her form-fitting gauchos, his eyes lingering on the bodice of her cotton blouse. ORDER YOUR COPY OF EVE’S AMULET TODAY! 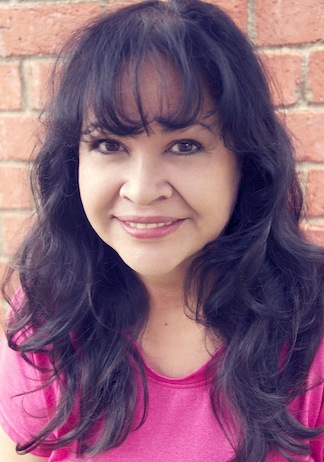 Please remember to subscribe to my blog!